LionsDeal > Tabletop & Bar > Menu/Information Displays >< Table Card Holders and Numbers > TableCraft BK1918 Mediterranean Number Stand with Flat Bottom 18"
TableCraft BK1918 Mediterranean Number Stand with Flat Bottom 18"
Mediterranean Black Table Number Stand, 18" tall, flat bottom, black. These are one of our most popular table card holders due to their simplicity, durability, and versatility. 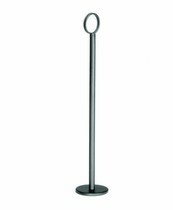 These table number holders are outstanding for banquet halls, restaurants, and caterers in high traffic venues where height matters. Mediterranean Number Stands by Tablecraft are the quality standard in the FoodService Industry. They are exactly what we needed for our library book sale to hold the signs for the different categories of books. Exceeded my expectations. Nice weight at the bottom and I am not worried about them being unstable or tipping after the table number cards are inserted. Very happy with the product. Delivery was fast and items were well packed.